Can history and a building bring people together? Yes, history can. The Hall of Fame does that every day and especially on Wednesdays. The Hall of Fame comes alive with song and laugher. That is when Milton Bullock and friends come together every Wednesday from 10:00 am to 1:00 pm. UPDATE: Milton Bullock and Friends starting March 21 are gathering every other Wednesday. Milton brings his smooth voice as a former member of the famed “The Platters” group. The vocal group is known for “Only You” and “The Great Pretender” as well as other hits. The Platters are one of the most successful vocal groups of the rock and roll era. Milton was one of the first inductees to the Twin County Hall of Fame. He is naive of Princeville and continues to live in the area as while he performs as “The Golden Platter.” Milton wanted to bring the community together through music with weekly performances at the Hall of Fame located in the Rocky Mount Train Station. Every week Milton with old and new friends come together to sing. They invited everyone to join you with many regulars taking the mic to sing solos. 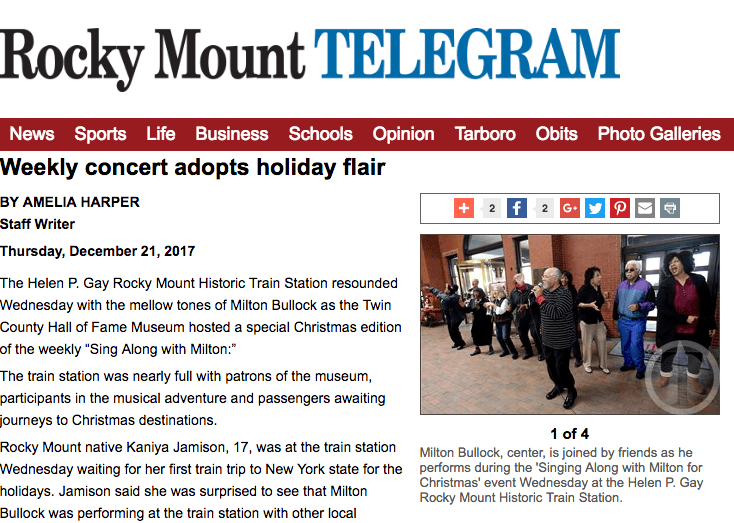 The holiday season brought more community members together with a holiday concert when the train station was busy with travelers. A new generation walked away with a new appreciation of music of the 1950s, the 60s, and 70s. The love of music transitioned into love between two regular concert-goers. Tony Williams and Rosa Joyner Steele fell in love over Milton’s voice. They plan to marry this spring. So when you think history doesn’t matter, think about Milton, Tony, and Rosa.